Heat pump hot water heaters are incredibly energy efficient! Most Bethesda homeowners really don’t give their hot water heater very much thought until they need repair or replacement. If your hot water heater needs to be repaired or replaced, you can trust the experts at Master Plumbing to restore hot water to your home with skill and professionalism. In recent years, the hot water heater market has been flooded with all sorts of new, energy efficient water heaters. These hot water heaters come in a variety of types with many different safety and operational features. One of these types is the heat pump hot water heater. Like other types of hot water heaters, heat pump hot water heaters use energy to heat water that is then dispersed to the rest of your Bethesda home. However, instead of using the energy to light some sort of flame or other heating element, heat pump hot water heaters heat water by pulling the heat in from the air surrounding the unit. It’s the same basic concept as your refrigerator pulling in cold air, but with heat instead. 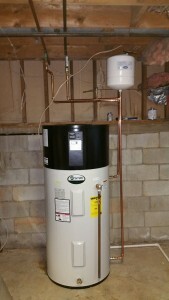 The heat pump hot water heater will pull in the air surrounding it and only keep the warm air. It will then use that warm air to heat all of the warm water your Bethesda home needs. One potential drawback to this method is that it can take a while to heat a large volume of water. For this reason, heat pump water heater models are equipped with a backup heating method to use in times of unusually high demand that is faster, but far less energy efficient. This backup heating method is also why heat pump hot water heaters are sometimes referred to as “hybrid” hot water heaters. Heat pump hot water heaters are exceedingly inexpensive to operate. Over the course of the approximately 13-year life span of your Bethesda heat pump hot water heater, it will save you an estimated $3,500 over some conventional models. This savings is not only good for homeowners, it’s also good for the environment. The EPA estimates that if every home in the U.S. installed a heat pump hot water heater in place of other models, it would prevent around 140 billion pounds of greenhouse gas emissions. The type of water heater you need will depend on the size of your Bethesda home and the type of fuel source available.